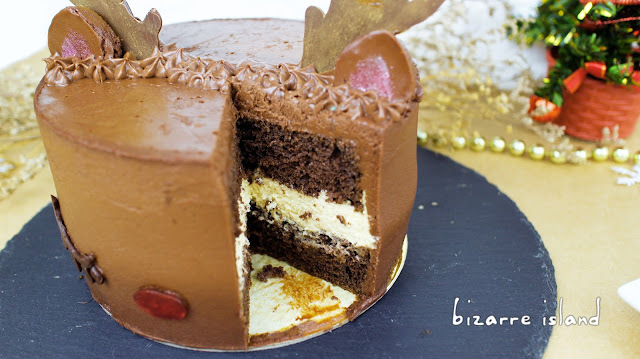 ~ bizarre island ~: Baileys Irish Cream & Chocolate Mousse Reindeer Cake for Christmas! 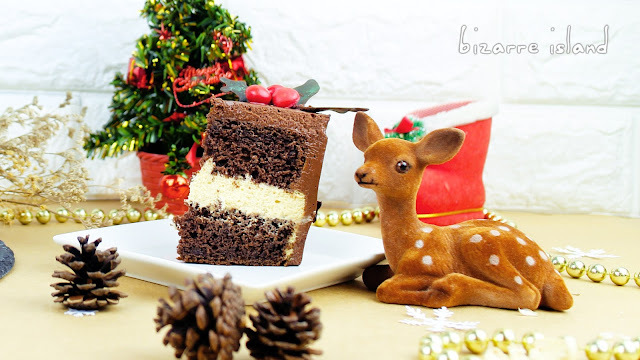 Baileys Irish Cream & Chocolate Mousse Reindeer Cake for Christmas! Everyone needs a christmas pudding for dessert after dinner with family and friends, why not make it cute and a center piece of your dinner party! 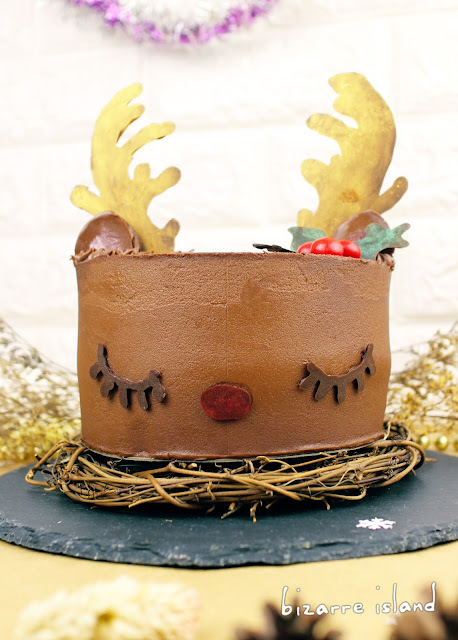 This cute reindeer cake will surely satisfy all your party needs. Showpiece? Check! Dessert/cake? Check! Chocolate? Check! Booze? Double Check! This cake is made with layers of chocolate stout cake, Bailey Irish cream mousse and chocolate mousse. The chocolate mousse is rich and decadent, the soft and spongy chocolate stout cake and the boozy light and fluffy baileys mousse. If I were to make this recipe again, I would build the cake a little differently. I would cut the stout cake into thinner layers and layer mousse in between those thin layers to make it a 6 layer cake. This will make eating the cake much easier. Just an afterthought, you can try it this way too. Part of this recipe uses box cake mix, you can totally make your own chocolate stout cake from scratch, but to save some time during a busy christmas dinner, we opt for a box cake! In bizarre island, we are not fans of fondant/sugar paste/gum paste/all the varieties of dough like confection. We avoid using them when we can, sometimes it maybe unavoidable, but we try to come up with other ingredients to "substitute" it. 1. It is "one-note" and does not add any flavour/texture that will enhance the dessert. 3. And because it does not taste good, people tend to discard it rather than eating it which leads to wastage. There are some cases that we will use fondant but most of the time we will try other methods before resorting to it. So after so much blabbering, I hope you like my take on an all edible, non-fondant Reindeer Cake!